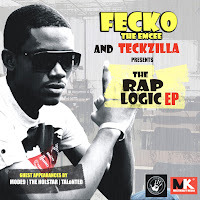 Fecko the Emcee & Teck-Zilla Presents THE RAPLOGIC EP. Guest appearances by Modenine, TALoNTED (U.S.A), The Holstar of Zone Fam (Zambia), Synik (Zimbabwe) and Fikrah Teule (Kenya). All tracks produced, mixed and mastered by Teck-Zilla for Str8Buttah productions.